The North East suburbs of Paris are definitely the uttermost suburbs to incorporate Le Grand Paris thanks to its greenery projects. You can find there as many paved paths than unpaved roads open to the public. Seine-Saint-Denis has also the advantage of having loads of acres of park and forests and canals as well as little patches of land where citizens can grow their own vegetables. This part of Paris's area illustrates perfectly French healthy culture based on sport and nature. There are bicycle routes all along the waterways that link urban, suburban and rural areas of Ile-de-France territories with a variety of appropriate cycling facilities. Some of the tracks have been specifically designed for off-road bicycle use along the waterways. There are several cycle paths through La Courneuve Park and some bike trails run along waterways like Canal de l'Ourcq and Canal Saint-Denis. 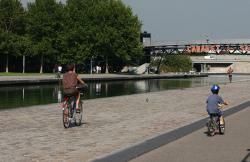 Separate bicycle lanes have been built all along the banks of Canal de l'Ourcq. Take your bicycle, rollerblades, and skates or rent a vélib (the Parisian cycle location) and go for a planned hassle-free cycling touring day with your family or friends. Be careful: Over weekends the bike roads can be incredibly crowded, as the park is shared with scores of pedestrians and dog walkers. Useful and practical information: 10 km of cycle trail crisscross the bucolic scenery of Georges Valbon La Courneuve Park. Bicycle tours can start right from the entrance of the park. Here, "La Maison du Parc" (the park administration on-site office) provides the best bike rental services. If you want to try something new and fun, you can choose to ride a tandem bicycle or even order small quad-cycle for four or large and very large quad-cycleq for six to eight people. The Paris London route called “Avenue verte London-Paris” is a must-do in the list of bicycle addicts who are visiting Paris. You'll live an unforgettable experience all while having great exercise for your body. Following this cycle route that links Paris to London is the guarantee to mix visits and sport! La petite reine is the best nickname French people could give to one of their favorite transport: Bike. The country of Tour de France is also known for it's rich heritage. For instance, the medevial town of Saint Denis shelters the Basilica of Saint Denis in which you can find many traces of the French monarchy and the Revolution. The best plan you can make for sunny days is to combine culture and sport pleasures, so don't hesitate anymore. A few kilometres away, visit the Stade de France that hosts the greatest sport contests and concerts during which over one and a half million spectators support their icons every year. Visit the Avenue Verte London-Paris website to plan your best cycling day ever. Consult our list of hotels and youth hostels that welcome bike riders and their vehicules.